As the temperature begins to rise it is now a good time to investigate how you can keep your house cool through out the long hot summer. 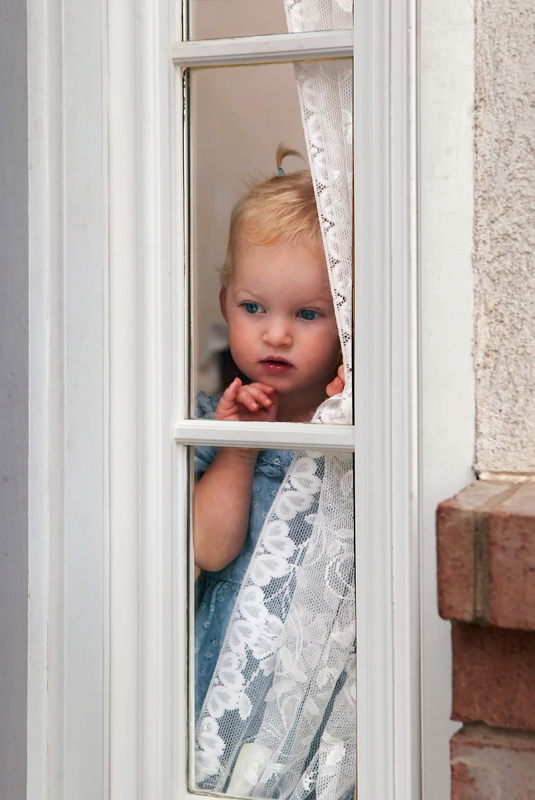 A simple and cost-effective way is to control the heat that comes through your windows. When people think of covering their windows their first thought is often curtains. But to keep your house cool in the summer and even warm in winter it is better to take a more holistic approach. 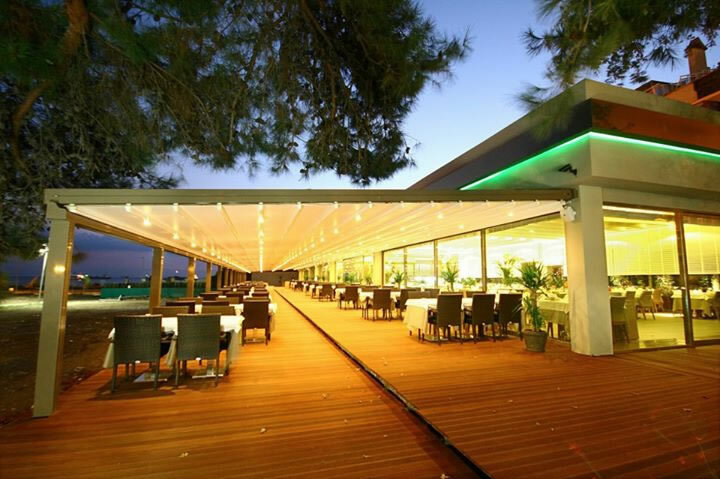 From shade to structure, outdoor awnings are a great way to add aesthetic appeal and function to your property. Through the addition of an awning, you can easily expand your outdoor living space while at the same time improving its beauty. Using your outdoor space by creating a cozy living area will not only transform your home, it can greatly improve your quality of life. Hanging outside has been shown to be good for mental and physical well-being. So, creating an outdoor retreat will definitely leave you healthier and happier whilst also increasing the value and look of your home. One of the easiest ways to create an outdoor retreat to take your home life outdoors and expand your living space is making use of awnings. Adding an awning to your outdoor area is actually the best and most affordable way to create a comfortable and luxurious living space on your front yard or backyard. If you want a quiet place to relax and entertain on your outdoor area, you must also set up protection against the elements (sun and rain) there. 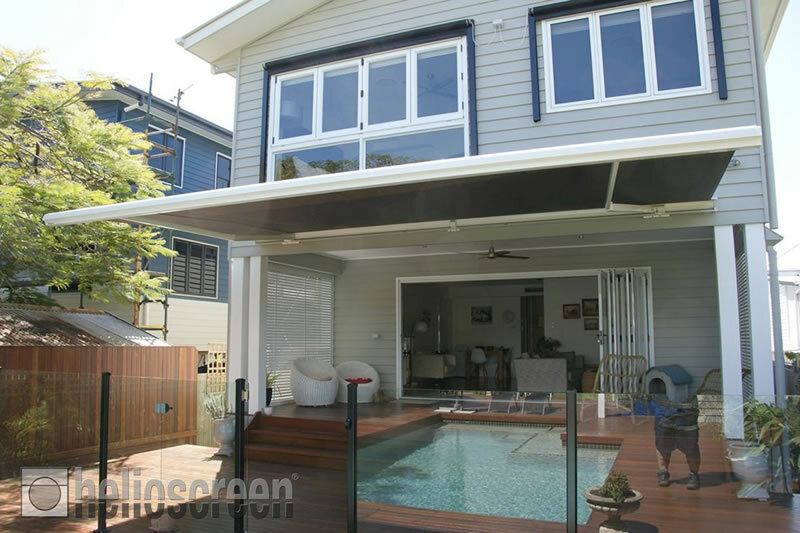 Outdoor awnings offer a stylish and practical solution for a pleasant entertainment area on the exterior of your property. Too much sun or rain can make time spent outside unbearable. 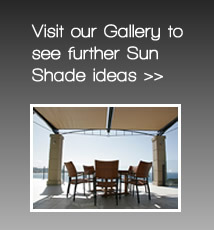 To add shade and protection to your patio, deck, porch or outdoor seating area, invest in a quality outdoor awning. 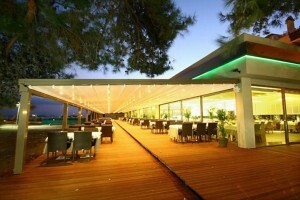 Outdoor awnings provide the ideal solution for creating a comfortable environment outside for the whole family to enjoy. 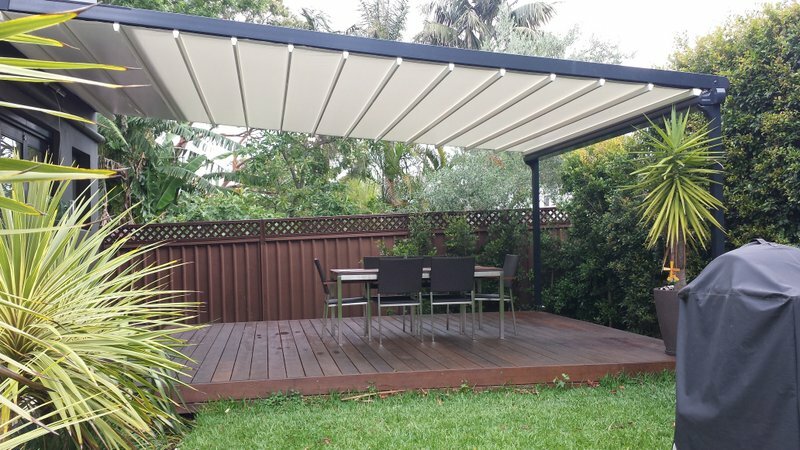 By adding one or several of these awnings to your property, you can realise a sanctuary for relaxation, entertaining and play right in your yard. This will allow you to enjoy your cooking and entertaining the way you’re supposed to, and at a fraction of the cost of constructing a permanent addition. Outdoor awnings will provide you and your family with complete protection against rain, sun, excessive heat and UV exposure, while also protecting your furniture and furnishings from damage. With a good awning, you’ll be able to expand your outdoor living space, where you can kick back under the sun and enjoy your outdoors without worry. The great thing about outdoor awnings is that they possess unmatched low-cost affordability and easy adaptability to almost any outdoor area. An outdoor awning for extending your outside living space can stand on its own, but it can also work well with another outdoor structure or fixture such as a patio, deck, porch, veranda, or pool area. When trying to extend your exterior space using outdoor awnings, you should consider the design of your house and that of the awning. Be sure to choose a quality awning that complements your home and landscape. Whether you need an awning to extend your back door area or a shade cover to suit your individual entertainment needs, choose an outdoor awning that perfectly matches the style and look of your house and surroundings. 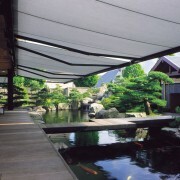 Outdoor awnings for extending exterior living spaces come in a wide variety of styles and fabric patterns. Some awning designs feature decorative patterns, and can serve as a wonderful accent to your home that adds a charming and cheerful focal point to your outdoor area. A beautiful awning can help accent your home’s patio, deck, porch or pool by providing a pretty backdrop to an otherwise boring exterior. Consider your home’s decor and determine whether you want your outdoor living space to blend with your façade or become an interesting focal point. Evaluate the style of your house and your home’s setting to make the right decision. As mentioned earlier, the best outdoor awnings for extending your exterior space will depend on the style of your home and its surroundings! 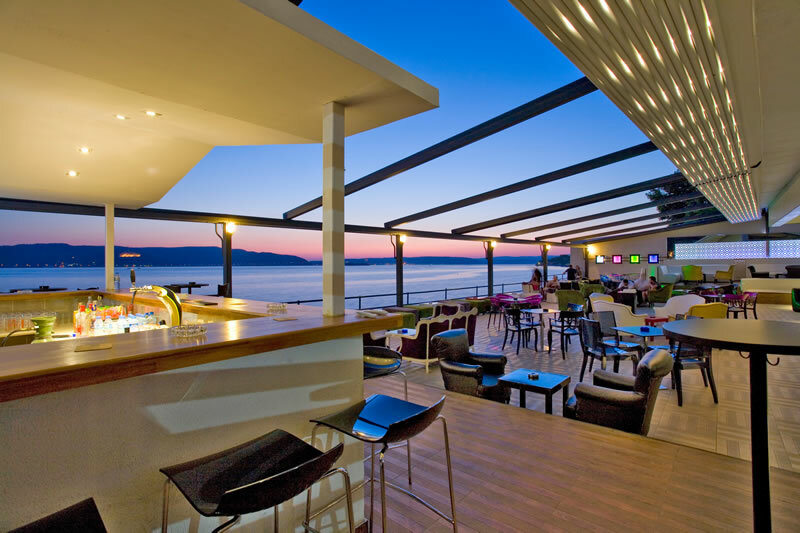 For example if your home’s landscape includes sunny seashore or a poolside patio, then awnings with bright tones will work wonders when creating an outdoor living area for entertainment or relaxing. On the other hand, if the surroundings of your home consist of woodland areas then awnings with neutral and/or earthy hues would be the most appropriate. Select an awning fabric that complements the architectural style of your house. 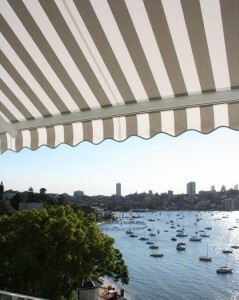 Some outdoor awnings, such as those that come with black-and-white stripes, can fit in any type of decor or landscape. But you have to choose the right size to achieve the best results. Coordinate outdoor awning fabric with the colours on your home’s exterior surfaces, such as exterior paint colour, cladding, shingles and trim. 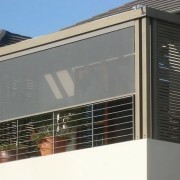 And pick colour patterns that are proportional to the size of your home and your outdoor awning. For a traditional style home, look for a fabric featuring neutral, navy or green colour to complement it. Colonial- and cottage- style homes may call for awnings with uniform bar stripes or neutral colours, while terra-cotta, salmon and beige stripes may work well with plaster-finished homes or those covered with shingles or terracotta roof tiles (Southwestern-style homes). Awnings with notched- or scalloped-edge valances, as well as those with integrated lighting, work great for contemporary homes; but it’s advisable to keep the design simple and the fabric solid. You can also use outdoor awnings as transitions. When trying to extend your outdoor living area, you can install your awning in such a way that it eases the transition from the inside of your house to other hardscape amenities on the outside – like the pool, patio or outdoor kitchen. 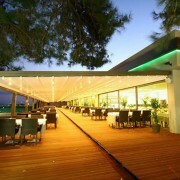 To achieve this, make sure your awning fixture integrates well with other outside living amenities. You also need to extend your interior style by choosing colour patterns that reflect those inside, particularly those in the adjoining rooms. When extending your outside space using awnings, you can choose between retractable and fixed or permanent awnings. 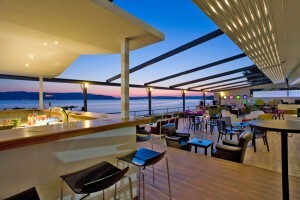 The choice of the design will depend on the size of your outdoor area and your specific needs. If the outside space that you want to extend is quite small, then you should opt for a retractable or folding model that you can remove easily. 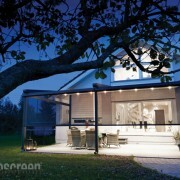 With a spacious outdoor area, however, a large permanent owning or canopy supported by posts may work well. You can take advantage of various awning accessories and options, such as motorization, rain & sun sensors, wind sensor, LED lighting, front awning valance and side panel, to customize your awning while deriving more benefits from it. 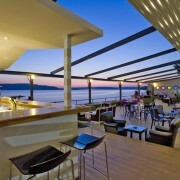 Consider working with a professional installer to assess your needs and help you pick the best awning design and fabric. Whether you choose an inexpensive freestanding option or a pricier retractable awning with all the fancy accessories, these shade covers will allow you to extend your outdoor living space and make it more inviting even on the warmest days of the year. If you don’t use your patio in winter, it’s probably because you haven’t adequately prepared it for the cooler months. 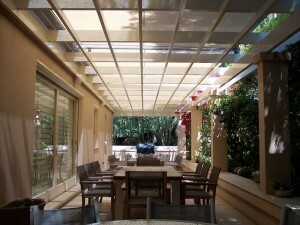 Do you have a patio cover? If your answer is no, then you won’t be able to make the most of your outdoor living space in winter. 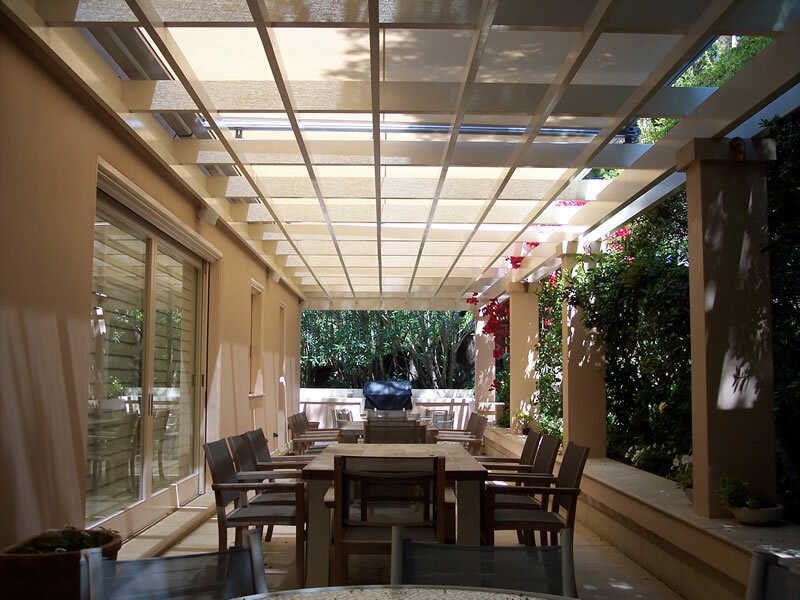 To use your patio more fully, more comfortably, more optimally, and with a sense of control, it will need to have a flexible and versatile shade covering. A deck covering will not only block the elements, but also help trap heat and keep the outdoor space warm. This can be achieved through a home addition like a sunroom or conservatory, or by adding an outdoor home accessory, such as awnings. Awnings offer probably the best way to cover your patio. 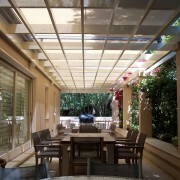 These patio accessories are available in many different design styles, such as retractable awnings, fixed awnings, external blinds and shutters and even umbrellas, to satisfy any need – privacy, decorative, shading around pools and, of course, to provide protection from the elements during winter. With a thoughtfully installed awning, you can provide a beautiful extension to your home, improve insulation, and make the most of your patio during this winter. If you install an awning over your patio, also consider installing external shutters or blinds on the side of the outdoor living area where the wind chill blows. 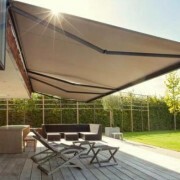 This will help keep your patio warm and protect you against any precipitation. Even in the colder winter months, if you’re protected from the harsh elements, you can still enjoy the crisp fresh air as well as the view from the comfort of your patio. When it gets cold winter you will need a way to keep warm. Building a fireplace or fire pit within the patio, or somewhere near, can help solve this problem and allow you to enjoy the refreshing outdoors without having to suffer the winter’s cold winds. Traditional fire pits and fireplaces use timber as fuel, but modern versions are powered by petroleum (LPG) fuels or alcohol (such as methanol). The newer models are, therefore, more reliable, safer and easier to work with. They come in many different styles, and you can easily find one that matches your individual needs regardless of the size or design of your patio. Building an outdoor spa, swim spa, spa pool, hot tub, gazebo or portable spa in your deck will allow you to have a wonderful place where you can hold some exciting parties, play those hot tub games, or simply relax while sharing drinks and snacks. There is a wide variety of hot tub designs, which means it’s easy to find one that perfectly fits your personality and blends in well with your property. Having a roof/shade covering over your patio gives you an opportunity to install comfortable outdoor furniture and furnishings. Throw in some handsome outdoor furniture, vibrant furnishings and fabrics, cushions and throws, and colourful rags to warm up the space. While at it, try to ensure that your patio accessories resemble your indoor furniture. By having beautiful outdoor furniture and furnishings that complement your outdoor living area or reflect a colour scheme used indoors, you’ll be able to integrate indoor rooms with your outdoor entertaining areas and achieve the best results. Installing heated floors underneath your floors means you can say goodbye to cold fee and enjoy your outdoor space in winter. It’s also a good way to dazzle your friends and family. Adding beautifully planted containers onto your patio is a simple, yet effective way to enhance the beauty and liveability of your patio during winter. Consider beautifying your patio, deck, terrace, or front porch with evergreens, natural branches, and winter cabbages and flowers to add colour and life onto your outdoor space. 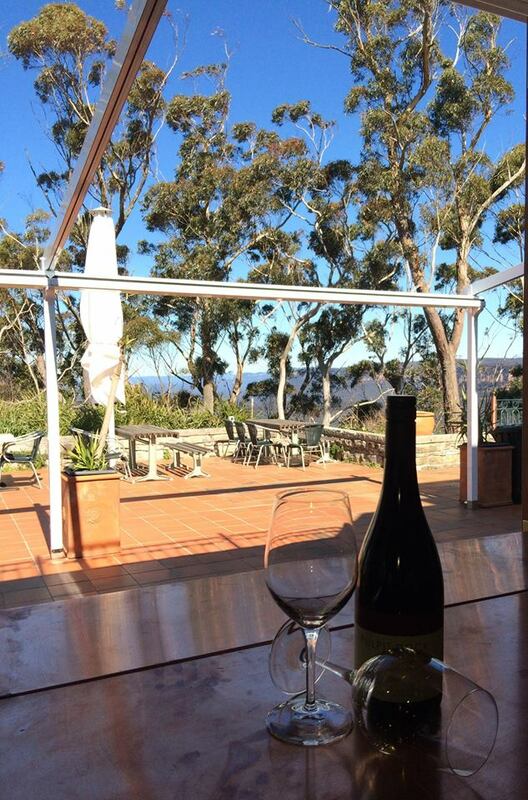 While the sun can be high and bright for part of the day, days are shorter in Australia’s winter. Winter evenings tend to be dull and cold. These conditions can limit the use of a home’s outdoor space in winter. One way to brighten up your outdoor space is by adding outdoor lighting. Installing well designed outdoor lighting onto your patio or deck will also accentuate your home’s architecture, illuminate outdoor spaces, and boost curb appeal. 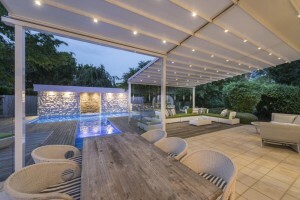 If you would like to install some outdoor lights for your patio, talk to your electrician or an experienced contractor about the best strategies for planning outdoor lighting. With spring slowly approaching you’re probably thinking about indulging in more outdoor activities. And then there are the Summer holidays to think about. Holidays are great, but more and more people are making the most of their home resorts and opting for the staycation. A great and affordable alternative to delighting in outdoor activity if you don’t have the option of your beach holiday is to invest in your home outdoor living areas. 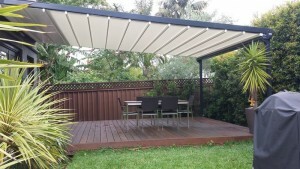 Awnings are a great way to dress up your backyard, patio or home outdoor area. Take advantage of the warm weather and add a beautiful awning to create the perfect area for relaxing and entertaining your family and friends this summer. 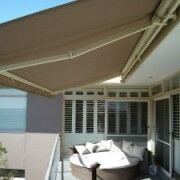 Awnings and canopies offer one of the best home improvements that you could ever implement. Adding well-decorated, well-planned awnings will improve curb appeal, express your individual style, and extend your living space, as well as give you a nice spot for warm-weather gatherings and relaxing. They can turn your patio into a shady retreat. After all, what’s the use of balmy summer weather if you can’t hang out in your patio and have some fun? 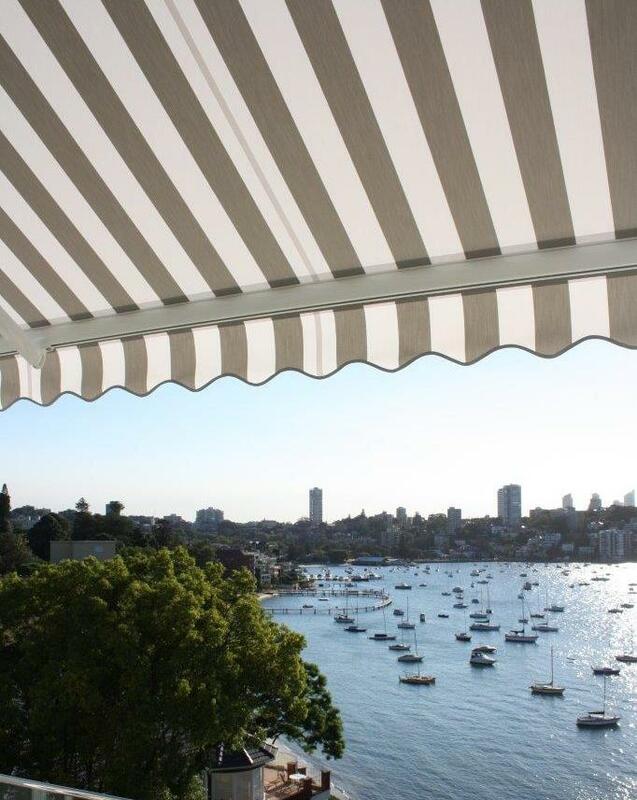 Residential awnings are usually made of tough, quality materials and typically come in a wide variety of patterns, colours, styles and functions to complement your home. A reputable awnings supplier can assist you in determining which awnings – free-standing, retractable, entranceway, storefront awnings or pergolas – are appropriate for your home and pocket. 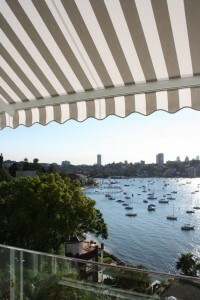 Residential awnings are beautiful and they will make your property look great. Installing stylish awnings will brighten up your property and certain elegance to your home, while also serving a practical purpose. If you plan to sell your property, these structures will make your property visually attractive, thus adding value and attracting potential buyers. Awnings are extremely useful for providing shade to outdoor areas and can turn your patio or other outdoor living space into an all-weather environment. The best thing about adding awnings is that they involve very little construction and are a relatively easy project to take on. You can create an entertainment room or additional living space in as little as one day. Residential awnings create attractive, inviting outdoor areas for people to gather and enjoy themselves while protected from the sun. 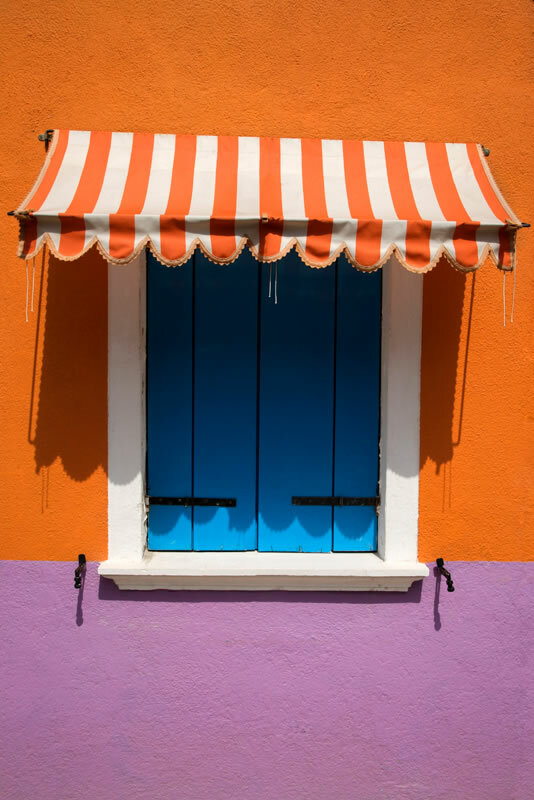 The materials used in making awnings offer excellent UV protection, and are typically resistant to rot and dirt. With a quality residential awning, you’ll be able to enjoy your summer to the fullest no matter what part of the day it might be. Residential awnings will not only provide cover during this summer, but they will blend with your home’s facade and become a colourful focal point. 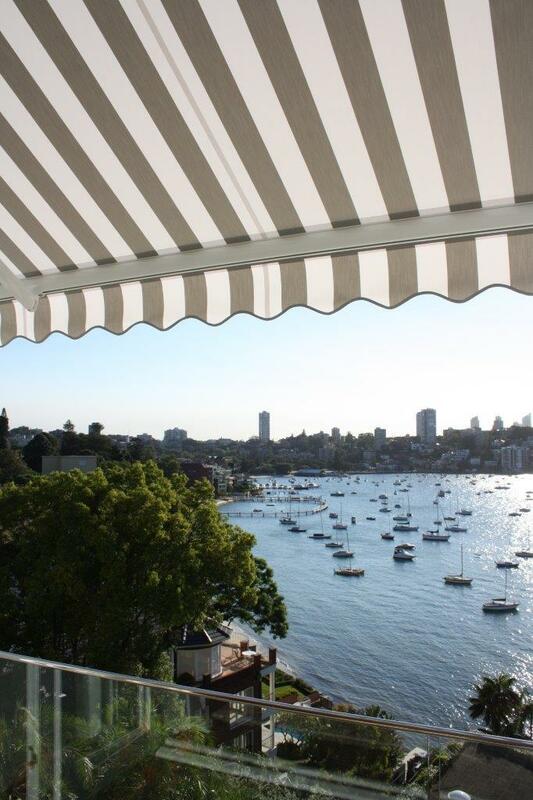 But to achieve this, you’ll need to look for awnings that complement the architectural style of your property. 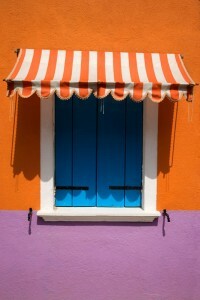 Awnings can help reduce your energy consumption by keeping your home cooler during the coming summer. They can greatly reduce the heat gain through the windows and door, and your AC won’t have to work harder, thus reducing your energy consumption. 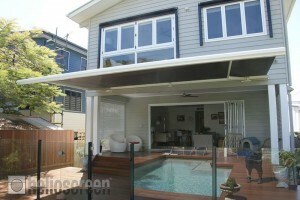 Awnings are probably the cheapest option when it comes to creating additional living space. They typically much less compared to building an extension or conservatory. With residential awnings, you don’t have to break the bank to have a perfect spot for summer outdoor entertaining. Order an awning today to turn your bland backyard, patio of deck into a stylish spot for entertaining this summer.